We’d love your help. Let us know what’s wrong with this preview of Dragon's Danger by Edward J. Branley. Joey, Anne Marie, and David are three teens from New Orleans. They’re smart enough to understand this. Imagine their surprise when a “dragon’s egg” they bought online turns out to be from an ancient trading company that sells “collectibles and curiosities”. Suddenly it’s more than just kidding around, as they help their dra Don’t believe everything you read on the Internet! For over a thousand years, the dragons have used the merchant concern, Hassan's Collectibles and Curiosities to help identify those worthy of becoming the "Blood Bound" -- humans who are willing to hatch dragon eggs and nurture the hatchlings to adulthood. The methods used by Hassan's have changed over time, but the results are the same. The dragons live! To ask other readers questions about Dragon's Danger, please sign up. My Thoughts - 2 out of 5 Unicorns - I liked the story idea!!! The cover is cute and what attracted me to the book. I saw this book on Storycartel, and I thought it would be a fun middle grade book to read. This book should not be marketed as middle grade. This book is confusing because it has a middle grade feel but the characters are high schoolers which confuses the whole thing further. I get that high school students flip each My Thoughts - 2 out of 5 Unicorns - I liked the story idea!!! I saw this book on Storycartel, and I thought it would be a fun middle grade book to read. This book should not be marketed as middle grade. This book is confusing because it has a middle grade feel but the characters are high schoolers which confuses the whole thing further. I get that high school students flip each other off and say f*** you, but generally this is not typically in a middle grade book. It is a good story idea, but one of two things needs to happen either scrap the middle grade idea and rewrite it so it is definitely older high school YA and develop the story and characters more for those readers or make it middle grade and fun, make the students younger in middle school, and drop the language from the book. I did like the story, but it was just not what I was expecting when I saw it was a middle grade story, and I think it needs work. I was disappointed because it was not the fun middle grade I wanted. This is my opinion and thoughts, and I urge you to make up your own mind as to whether you should read this book. When I first read this book’s description, I didn’t know if I would like this book at all. I could already see how this idea could be ruined with a few writing mistakes and go completely haywire. But, I can’t say that that happened. With every ring of the doorbell, I was more and more excited to see what is coming from Hassan’s and how each of the character’s reacts to what they get. These characters worked really well together and the way we learned more about them throughout their actions reall When I first read this book’s description, I didn’t know if I would like this book at all. I could already see how this idea could be ruined with a few writing mistakes and go completely haywire. But, I can’t say that that happened. With every ring of the doorbell, I was more and more excited to see what is coming from Hassan’s and how each of the character’s reacts to what they get. These characters worked really well together and the way we learned more about them throughout their actions really kept me interested. Their interactions with themselves, their parents, friends, and the dragon seems real and it was very interesting! The way they seemed like regular teenagers and do regular things that teenagers in this current day and age do: post photos on Instagram, play video games, dealing with school and hiding this huge secret from their family and friends! For the beginning of the book, there is very minimal action as we are still being introduced to the characters, the setting and given more backstory. But, things really start to pick up towards the middle on to the end with some great action scenes that keep you hooked! With every turn of the page, there are new developments, more discoveries, and still maintaining the friendly joking. Branley does a great job of developing the setting and not overlapping ideas. When the setting transitions, it is clear and this makes the book easier to follow. While you’re reading, some of the things brought up bring up questions in your head and it can be confusing but things are mainly settled out as the book goes on. I think that the sense of time in this book is really good and the way that the author ties in certain events to push the action more and more was excellent. The ending of this book was absolutely amazing, a twist that I would never expect coming into it, even leading up to it. But, the ending pages were extremely action packed and exciting! The entire action sequence kept me on edge and I actually didn’t know what was going to happen at all, it threw me for a loop then put me back together all in the matter of about 20 pages, it was amazing! I am definitely going to stick around for the next books in this series! 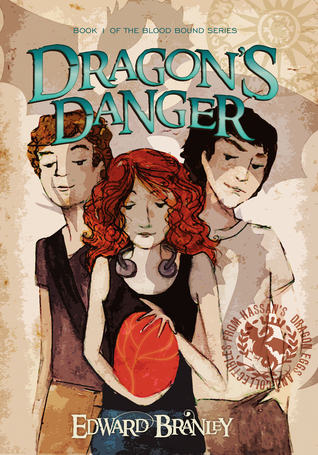 This book has three teens, an amazing dragon support service, and video games as well. These three teens order a dragon egg. To their shock, it's real. It hatches and that is just the start. This book has adventure, secret groups, quest, poetry and a beautiful dragon. HOWEVER, the cover art And age ratings are VERY misleading. The major drawback is some very serious language (cursing mainly shocking F-bombs) and crude gestures that should have been left out of this book. Otherwise I would have be This book has three teens, an amazing dragon support service, and video games as well. These three teens order a dragon egg. To their shock, it's real. It hatches and that is just the start. This book has adventure, secret groups, quest, poetry and a beautiful dragon. HOWEVER, the cover art And age ratings are VERY misleading. The major drawback is some very serious language (cursing mainly shocking F-bombs) and crude gestures that should have been left out of this book. Otherwise I would have been able to give it a much stronger recommendation. Not only was it shocking, but it really took away from the book jerking you out of the story every time. There was enough of that to drastically alter the appropriate age range for this book and mess the story up rather badly. Had I known I would have skipped it because it's that bad. I'm sad to say that I didn't like this book as much as I hoped. I really like the idea behind this book. But sometimes it is told too fast and sometimes nothing happens: the main characters just play games on various devices (all named). The happenings (to the dragon) at the end came as a (pleasant) surprise. But you expect that some things will be explained, to the Blood Bound and to the readers, but that doesn't happen. And there are several grammatical mistakes. A pity! This story has the pote I'm sad to say that I didn't like this book as much as I hoped. I really like the idea behind this book. But sometimes it is told too fast and sometimes nothing happens: the main characters just play games on various devices (all named). The happenings (to the dragon) at the end came as a (pleasant) surprise. But you expect that some things will be explained, to the Blood Bound and to the readers, but that doesn't happen. And there are several grammatical mistakes. A pity! I like the way characters developed during the story, they really work together. The story is fresh and leave you with a good taste on your mouth. I DNF'd this book because it felt unpolished and betrayed a lack of understanding about the middle grade audience. Non stop action when three high schoolers get thrust into a world of dragon rearing. An enjoyable adventure for teen/young adult audiences. A former high school History teacher who now does computer consulting and training, Edward Branley is the author of five books in Arcadia Publishing's Images of America series, one YA novel, and one Urban Fantasy novel. He has also written numerous articles for computer publications/websites, and also co-authored a book on Windows NT that had a shelf life of less than six months. Edward blogs at ww A former high school History teacher who now does computer consulting and training, Edward Branley is the author of five books in Arcadia Publishing's Images of America series, one YA novel, and one Urban Fantasy novel. He has also written numerous articles for computer publications/websites, and also co-authored a book on Windows NT that had a shelf life of less than six months.